Win Sin Pte. 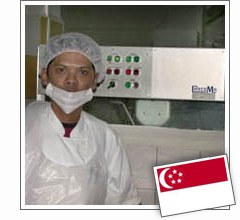 Ltd., Singapore, manufacture boutique pralines and customized chocolates. Win Sin Pte. got their first Chocoma machine in year 1993 and have in 2005 acquired additional tempering and enrobing capacity. Today Win Sin have a wide range of Chocoma chocolate processing equipment which include enrobing machines 5B24 & 2MP40, and tempering machines 6T20C22, 2T130 and the 4TX50 – all machines are under the control of Lead Machine Operator Mr. Azri Hamzah.